Visit the Gordy Center website reinhardt.edu/dining for menus, health & fitness, catering, hours of operations, food choices and rates. For more specifics call the Gordy Center management at 770-720-5611. 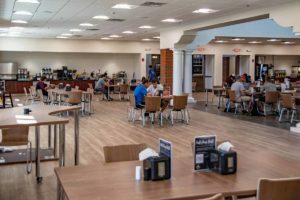 The Gordy Center Main Dining Room is open every day the residence halls are open during the academic year (mid-August to late April). During Fall, Christmas, Spring and Summer breaks, meal hours vary. See the Academic Calendar for exact dates. It is best to call to confirm hours during school breaks. Check options for breakfast, lunch, dinner, between meals or late night, when available. If you are interested in booking the Gordy Center for a special occasion (holiday party, civic meeting, wedding reception, sports banquet, etc. ), please contact Karen Douglas at 770-720-5538 or KWD1@reinhardt.edu.